These frames help explore solutions for what design thinkers called ‘wicked problems’; difficult, intractable, nebulous or impossibly contrary questions that challenge the structures and fabrics of practice. In higher education, wicked problems are pervasive and disruptive for evolving and emerging practices. They arise from the relationship between learners and teachers, between the faculty and institution, between the centre and the Schools, between technology and things remaining the same as they have always been. But within the design thinking approach there are some perceptive and practical insights that can inform the idea of learning experiences as a critical factor in learning and teaching design. Human – Teaching and learning is a human activity. It is social and is guided and shaped by the mores, tropes and vagaries of human communication. Identity, status, privilege, roles, language and intent are pushed into a sense of hyper-reality in the context of education. Ambiguity is a parlour trick we often use to ensure the fourth wall remains unbreakable. And next week, you will find out the secret of passing the exam, this week I will tempt, next week I will taunt, maybe a bit of tease the following week. But ambiguity also can be a positive, taking the next step without knowing what is underfoot; leaping off a cliff hoping there will be someone there to catch you. Ambiguity is more than a cliff-hanger. It is a function of learning as an adult, because life is ambiguous. Re-design – Almost all teaching is a process of redesign, whether its curation, remixing, re-purposing, summarising, aggregating, commenting. Tangibility – making it and keeping it real. Case studies, application, life experience, problem solving, practicality, it’s all there in what most people call good teaching and learning. Post-digital learning experiences are a design thinking process. How do we break the intractable nooses of institutional entropy, technological tensions and the incongruity of expectation? How do we design tangibility, ambiguity and humanity into teaching and learning so that outcomes are enhanced, durability of learning continues to extend, transferability of experience is enhanced and the effectiveness of education is exponentially increased? How do we do design thinking for learning? This post will explore how to design learning experiences relevant for the post-digital age. The PDLE idea comes from applying a design thinking approach to the wicked problem of teaching and learning in a modern institution, with modern learners and modern disciplines. It comes from the debate constructed so often in my blog about what happens if we do nothing. What happens if we ignore the changes in learners, learning and society and carry on advocating the holy virtue of pen, paper and note taking? What happens if we ask people to turn their devices off in order to learn or demonise them for wasting time on frivolous uses of technology? Because often, that is where we are and that is the entrenched position defended to the death by the pure of heart from the marauding techno-hordes. It comes from the way people design stuff other than learning. Art, media, careers, discoveries, business, innovation and their lives. As a learning experience found can have many guises. From the discovery of new and exciting ways of thinking and seeing, to the co-opting of knowledge from diverse disciplines in order to have insights into your own. From seeing an image and telling a story, through to the remix and re-purposing culture of digital media making, through to the finding of meaning, found can change the way learning happens. However, much of modern learning uses found in its paste tense form. Knowledge has already been found, and the job of the academy is to present you that knowledge. The job of the research academic is to find out more. The student is not the finder. The student is the repeater of found knowledge. The student is the next in the chain of Chinese whispers. In a modern bricolage culture, found is no longer a past tense. It is a sense of future discovery; it is a label for artefacts and raw material. Learning experiences that build on found enhance curiosity, complex linkages, independent thinking, collective intelligence, the progression of knowledge and an educational ambition that sets to to make that sure that there is more than that to be found. Knowledge as an experience is not static in a found learning design. It is a body of active pieces waiting to be reconstructed, reinterpreted, rediscovered and reused. There has been an incredibly large amount written about making (in a post-digital world). For a much better exposition of this idea, I point you to the work of David Gauntlett and his brilliant piece on making called ‘Making is Connecting’. Making is a core learning experience. It is rooted in conceptual frameworks like creativity, problem solving, tactility, abstract thinking and practicality. Maker spaces have traditionally been the realm of engineering and sciences but I have been advocating the creation of maker spaces for a wide variety of disciplines. I am working on what a maker space would like look for the social sciences. At the core of making for me is the concept of owning. The learner owns the experience, the space, the outcome and the solutions. Making challenges the theoretical safety net of HE to be realised in a practical environment. Equally, creativity is a fundamental. Technology has democratised creativity. Technology has made your ability to make with others, share with contemporaries and make your making available exponentially wider and easier. Everyone is creative in some way. Creating learning experiences that provide people with the opportunity to make something opens up avenues of learning that consumption and reception can never replicate. It might be as simple as a case or simulation right through to technology-led practices like media making, app development, product design or innovation. There is a growing movement to make making more explicit and tactile, maker spaces and labs, simple to use but complex apps that allow everything from music making, to knowledge presentation through to design work to be done on a tablet. Making is a design activity that is multi-sensual, trans-disciplinary and a tookkit for life-long learning. I have written a lot about identity in a post-digital age. It is a complex thing, caught flash hard in the debates about safety, responsibility, expression and citizenship. Identity as a learning experience is inherently trans-disciplinary, providing a skill relevant across learning trajectories. Without re-hashing the debates about digital identity (that you can see splashed through my blog history), there are some key aspects relevant to learning design. Identity formation is a critical learning experience; what is your identity within a discipline? Where do you fit into traditions and discourses? Identity sharing is a learning experience at the heart of effective portfolio learning, professional development and connected experiences. Identity development is a 21st century skill, knowing how to use and develop, manage and nuance multiple identities for different aspects of your life. I have written a lot about the digital stranger (the person who reveals only small slices of themselves in an on-line environment, made easier by avatars, light touch registrations and the blurring of identity in social media) and how fleeting connections with people can shape thinking and development of beliefs and practice. One of my favourite writers, Stephen Brookfield (1984) really nailed this idea in an article called ‘Tales from the dark side: a phenomenography of adult critical reflection’ In this seminal piece, he talks about how identity impacts directly on how we reflect critically as practitioners, identifying senses like impostership (the idea that reflection is not for the ‘likes of me’, cultural suicide (that to be true and honest in reflection could be shaming of friends) and lost innocence (that reflection troubles to address ambiguities best left unaddressed) as darker sides of identity interacting with communication, reflection and the practices of teaching. From the way media can be shared and critiqued, to peer assessment, through to exploring and interrogating the necessity of anonymous double blind marking, identity is a learning experience that crosses through much of the learning activity we engage in. And like the rest of these learning experiences, it is not the sole domain of our students. Identity is at the heart of teaching practice too. The cult of the expert, the theatricality of the fourth wall in a lecture, the capacity to always be right and the artifice that protects poor assessment and feedback from anything other than student satisfaction criticism are all informed by crisis’ and concepts of identity. We all play. Life is full of play. And play is equal parts fun and risk. Some of the most fun we have ever have is when we play with risk. Jumping from planes, falling off slippery dips or singing our signature song at Karaoke, this time in front of a live audience (I will tell you mine, if you share yours. All song titles in the comments!). Play is great. Trouble is that learning can be so damned serious. Brows get furrowed. Stress balls are made from competing deadlines. It seems that we are happy when are students aren’t having fun but worrying and stressing. Part of life. And then there is us. Where has the fun gone in our jobs? Counting down the months, weeks, days, hours and minutes to holidays. The stress of tenure and the worry that if even the smallest thing goes wrong, we are back searching on jobs.ac.uk. Failure isn’t an option when it comes to pedagogy. NSS scores, student evaluations, the push to higher and higher student achievement have driven all the fun and experimentation out of teaching. So, how do we bring play back into learning? We have to encourage students to experiment, to fail, to fall flat on their faces or find themselves succeeding despite their best efforts, all in safe way. It is no longer acceptable to simply get a degree in the UK. You need a good degree (although hopefully this stupidity is now changing). We have to support a culture where play and experimentation are natural components of good teaching. Where we learn as much from failure as we do from success and we bring students along with us on the ride. That way they don’t feel like guinea pigs when they are paying £9000 fees. Play means a chance to use games, digital storytelling, media making, Lego, role plays and other mechanisms that break reality and put people into slightly uncomfortable roles. I used to run a class where I used a thing called interactive case studies. These were all set around a restaurant where certain characters created a scenario for HR or management students. I asked for a few volunteers from the class to play these characters. I gave each ‘actor’ some basic character traits and asked them to improvise the characters based around them (simple traits like ‘always brought things back to them’ or ‘always lies’ or ‘will always support character Doris, even when she is wrong). Sometimes it worked, and other times I had to step in, moderate and lead. But every time I ran it, it was fun. People laughed and played. I gave people who weren’t feeling comfortable to chance to ‘tag’ another student into their role. This was a safe space. There were no grades, no pressure, some risk of public performance, but it was all about learning. It tapped into identity, roles, perceptions and attitudes, all crucial skills for people management. We learn through play. It doesn’t have to infantalise or regress people. Adults play. But experimentation and play, whether it be through humour, or simulation or gamification are effective post-digital learning experiences. Life is chaotic, messy, non-linear, traumatic, joyful, unexpected and unpredictable. Memory is much the same. Learning however, is in the main structured, scaffolded, episodic and linear. This tension could afford education with a unique opportunity to develop skills in navigating, leveraging and riding the chaos. Instead, it tries to control it and at worst ignore it, assuming normalcy and norms dominate. This norm driven perspective assumes for example, that the jobs that existed when a student started their degree look exactly like the world they will enter three years later. This is an interesting concept, not less for the debates around what is authentic. Authenticity as a learning experience is rooted in ensuring that what the learner does feels and in effect is real. Realness is a very fuzzy concept in an on-line world. From the variability of identity to the mask of reality that on-line interaction can afford participants, defining something as authentic is difficult. We may have defined authenticity in learning pre-digital age as things like field trips, simulations, model offices, work based learning or professional practice. But in a more complex learning world what can constitute as authentic? At a simple level, it is about making sure that the learning experience means something, that it is not simply a test of character, or the rite of passage afforded to those who get to experience higher education, as an ivory tower hall of rotating knives. At a more concrete level, it is about the skills required to develop ethical frameworks, approaches to working with and supporting people, developing and changing the world, and an academic/student relationship that is built on a dialogue or a conversation where each are shaped by the interaction, not a monologue delivered by someone who will never know your name. Authentic experiences are not easy to facilitate, in fact, I would argue that it is the hardest of the PDLE. It is inherently personal. Authentic experiences rely on trust, the developing of a relationship, the exchange of experiences and the realization that learning is a complex amalgam of the interpersonal and personal. Community is something that people crave for from a university experience. Being part of a learning community (as opposed to a community of learners) is empowering. But equally when that community can crowd-source knowledge and solve problems, when that community can leverage the power of the massive and through technology can span location, engage in social behaviours and create and share knowledge then it becomes truly transformative. Community learning experiences build on the social aspects of learning; collaboration, collective assessment and engagement, group work etc and social media changes that game entirely. A social media community is far more than Facebook and Twitter. Social media explore innovative pedagogical practices like making, ideation, creation, critique, sociality, connected practice, crowd-sourcing, entrepreneurship, digital citizenship, media making, identity, politics and policy. And that is just the start. The communities that form on social media are equally fleeting as they are lasting, large as they are intimate, collaborative as they individual. They support lurkers, talkers, loud mouths, itinerants and learners. Social media are being used by your students now. They may be consuming yours, making their own, using their existing networks to find out stuff or leaving others because they have developed and moved on. Yes, they can have arseholes in them, but so can a bus. Yes, they have trolls, but so does a classroom. Community formation and development through social media is not a ‘trend’, it isn’t ‘new’ nor will it go away like fax-based learning (was that ever a thing?). Social media is for the foreseeable future how the internet is wired. It is how society is increasingly wired and it is how many people form and nurture their communities, inside and outside work. Sure, not everyone is an expert or a natural at social media. Not everyone likes talking on phones neither. Doesn’t mean we never used them for work. There you have them. 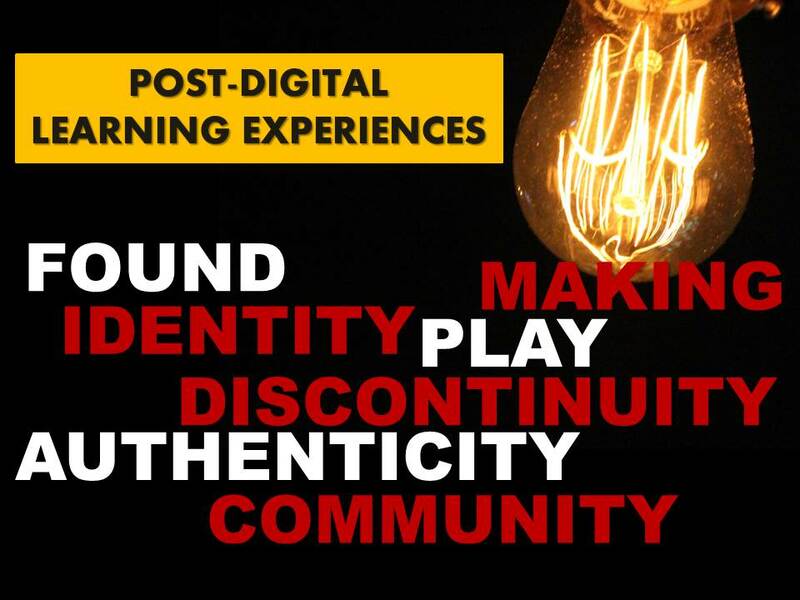 Seven post-digital learning experiences. None of them are ‘new’. They are all built on good teaching practices that we have done ourselves or experienced. They are rooted in deep traditions of experience, both socially and professionally. They are not exclusively digital, but they are amplified and enhanced in a digital environment. Technology makes them more possible and multiplies their potential. They will work in off-line, blended and on-line environments because in a post-digital institution, there is no discernible difference. They will will in open, free learning and closed residential experiences. I know, we have made them work. This is the shape of learning in the 21st century. It is complex for sure. It is not as simple as a voice in the room and the furious scribbling of pens. It is not something that can be summarised in a high stakes exam. But to be honest; effective, active, real learning has never been that anyway. This entry was posted in collaborative practice, community, critical reflection, digital pedagogy, e-learning, higher education, identity, innovative pedagogy, learning, learning experiences, play, Social media, teaching and tagged digital, e-learning, education, higher education, innovation, learning, pedagogy, post-digital, teaching, technology, technology enhanced learning, university. Bookmark the permalink.